I conjured up a vision of the panini and the flavors before I had even decided on the ingredients. Something with a little heat, but maybe an element to cool it down. Mild cheese, nothing too grandiose. A bright-flavored herb or vegetable that complements, but doesn’t distract from, the gentle spiciness. A good crunch on the bread. Colorful. The reality from this vision? Red Chile Chicken Panini with Monterey Jack Cheese, avocado and red onions on sliced sourdough. Can’t you just tell by the look of this thing that it was tasty? The red chile marinated chicken in this sandwich is pretty darned amazing. I found the recipe over on Simply Recipes (I refer to Elise’s blog several times a week – even more now that she’s got an iPhone app!). Aside from all the chiles within the chile sauce, there is warmth and subtle sweetness from the addition of spices such as cloves, allspice and cinnamon, which creates a real depth of flavor. For ease of layering the chicken into panini I opted to use boneless, skinless thighs rather than bone-in, skin-on and did my grilling right on the panini grill. Even with these modifications my husband and I still absolutely loved this chicken. Heat oil in a medium sized saucepan on medium heat. Add the chile sauce. Add vinegar, cloves, allspice, cinnamon, cumin, black pepper, oregano and garlic. Bring to a simmer and let simmer for 5 minutes. Remove pan from heat and let cool. Sprinkle salt over all the chicken thighs on both sides. Put chicken thighs in a non-reactive bowl or a large freezer bag. Add the marinade, make sure all pieces are coated well with the marinade. Marinate in the refrigerator at least one hour, preferably overnight. Remove the chicken thighs from the refrigerator. Preheat the panini grill* to medium-high heat (375 degrees). Grill the chicken thighs with the lid closed for 7-8 minutes until cooked through. Unplug the grill and carefully clean the grates. Reheat the panini grill to medium-high heat (375 degrees). For each sandwich: Brush melted butter onto the outer sides of each slice of bread. Spread a thin layer of mayonnaise inside the bottom slice of bread. Add onions, avocado, 1-2 chicken thighs and cheese and close the sandwich with the other slice of bread (buttered side up). Grill the sandwich for 4-5 minutes until the cheese is melted and bread is toasted with nice golden grill marks. Serve immediately and enjoy! * No panini grill? 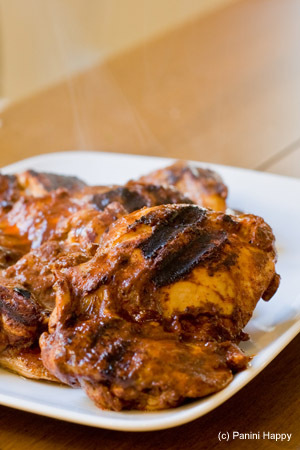 Prepare the chicken following Simply Recipes’ original recipe for Red Chile Marinated Grilled Chicken and refer to How to Make Panini Without a Panini Press for tips on alternative ways to grill your panini. This looks gorgeous! Such wonderful flavours! That looks delicious! 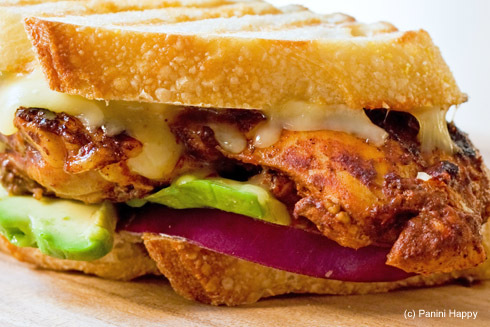 The red chile chicken sounds fantastic, and everything together on the sandwich is perfect. You make me drool with each new panini! Love the photos…and the panini! Gotta love that flavor combo. Inspiring. The cloves, allspice and cinnamon are what we really love. Those babies can make chicken sing! Definitely one of my favorite of all of your panini thus far! These photos are absolutely gorgeous! I would love a bite of this sammie. 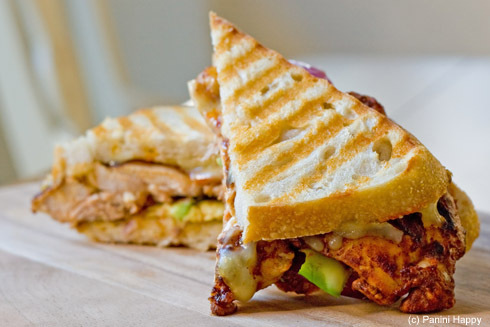 This looks good…but for whatever reason I can’t get your bacon/tuna panini out of my head. I bought bacon and had tuna salad on 2 seperate occasions to try to quell the cravings but I think I’m going to need to recreate your recipe, pronto! just seeing the pale green of the avocado gets me excited every time. AWESOME sandwich, and there’s even cinnamon involved! It almost reminds me of tandorri chicken. I read about a corralation between Mexican flavors and Indian. Looks divine. Looks great and very tasty. Yum. I love this sandwich – I was just thinking of making a chicken burger soon. I will be trying this recipe! Looks like a great new flavor for chicken. Chicken can become so boring, and I tend to make it more than any other meat. I wish I’d never found your blog because now all I can think about is panini presses. ARgh. This panini sounds so good! Excellent sandwich! I love the balance of flavor. I love the grill marks on your last picture. It looks so fresh and yummy! And I bet Elise’s chicken would make a great panini, judging from your photo. Very nice! Now that’s what I call a sandwich. The hue on the chicken looks amazing. This looks like an amazing sandwich! I think I might start dreaming of this one. Such juicy sounding chicken and I am all in for a little kick! Previous post: IMPROVED Panini Happy Recipe Index!